Winter is slowly finding its way into the capital of Czech Republic. The perfect time to sit down in a cozy place, read a book and treat yourself to a good old cup of tea. 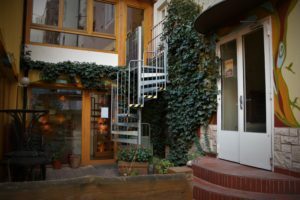 We scouted around for the best tea houses in Prague so you do not need to freeze in the fierce breeze that is blowing through the streets, searching for a spot to unwind and enjoy. Legend has it that Shennong, the legendary Emperor of China, one fine day was drinking a bowl of hot water, when a few leaves from a nearby tree were blown in his direction and fell into his beverage. The leaves made the water change its color and smell. Shennong then proceeded to try the colored water and found himself pleasantly surprised by its flavour and restoring effects. Whether or not this – or the many other legends – actually represents the birth of the soothing brew, it is nowadays believed that tea drinking originated in the Southwest of China. More specifically, the Yunnan region is often referred to as the birthplace of Camellia Sinensis and is said to have introduced the brew in the Shang Dynasty. When Great Britain entered the tea game in the 17th century, they introduced tea production in India, in order to compete with the original tea force: China. And born was a second strain of tea. As the world got more discovered, more and more strains and ways of preparations became known. Though there are more than 3’000 different sorts of tea, today we know 6 major strains of tea: White tea, Green tea, Yellow tea, Oolong tea, Black tea and Pu-Erh tea. 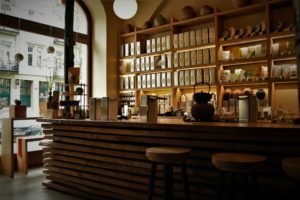 Looking at the history of Tea Houses emerging in Europe, Czech Republic was more of a late bloomer. While the Czech coffee houses (Kavárna) had long been around in Prague, the taste for tea really only found its way to Prague in 1848. 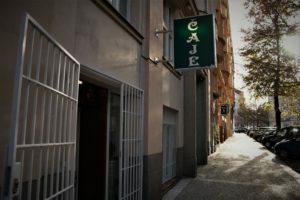 While the coffee houses managed to stick around in the city even through the wars, Čajovny’s found themselves forced to close one by one; no more tea drinking in the city! Only in 1989, a tea house revival came around. Aleš Juřina was the man that brought the public back its tea when he opened ‘Dobrá čajovna’ – the mother of Prague’s tea houses – on Wenceslas Square. Tea by tea, pot by pot, other tea houses started to pop up again and enriched Prague’s hot beverage scene once again. Today, there are about 150 tea houses in the city. 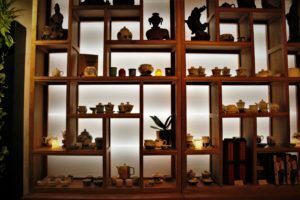 The selection is vast, but do not worry; we found 5 of the coziest tea houses for you! One of our favourite places to slurp some delicious and healthy tea! Though located in a very busy area – I.P. Pavlova – U Džoudyho is well off the beaten path. The tea house can only be accessed by walking through the store with the same name or by ringing a door bell of the bordering apartment house. This probably explains why U Džoudyho is never crowded and maintains an oasis of silence. The small terrace area, with rose bushes and ivy is the perfect hangout spot in summer, giving a visitor the feeling as if he was in his own, private garden area. When winter hits, the tea house offers plenty of space to flee the cold and get cozy. 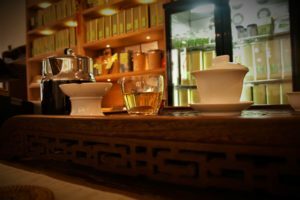 With comfortable seating on the ground floor and even a chill out zone on the mezzanine above, U Džoudyho is appreciated by tea enthusiasts and chill out experts likewise. But there is more than just the atmosphere behind the tea houses’ success: Freshly and expertly brewed tea that will give you just what you need. Whether you need a tea that will calm you down or a cup that will wake you up, the skilled staff of U Džoudyho will brew you the perfect cup. This well hidden tea house opens at an oddly specific time of the day: ‘Startujeme: 12.34’ says the sign hanging on the rather unobtrusive building. Upon entering the place, a wave of coziness and warmth floods the tea lover and makes you want to stay for hours on end, trying all of their delicious cups. Na Ceste, though close to Karlovo namesti and I.P. Pavlova is not overcrowded at all and thus creates the perfect feeling of being far away from the hustle and bustle while being close enough to everywhere so you can run off to your next meeting. A truly fantastic tea experience in Prague 2! Here comes a tea house with exceptional leaves for brewing. 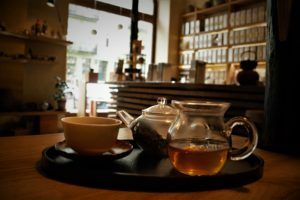 Located in the hip area of Prague – Karlín – the guys from Tea Mountain are bound to give you a phenomenal tea time experience in the city. 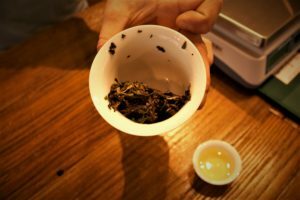 The guys at Tea Mountain know their leaves – and everything about brewing, serving and benefits of tea. The very friendly staff in the modern spot is happy to answer any questions you might have and will prepare you a cup that will make you come back for more. With their modern appearance, the tea room in Karlin makes us want to stay for hours on end, getting a taste of every tea in the whole wide world. Have we mentioned that they offer tastings? Be it tea newbies or pros, Tea Mountain’s tasting has something in store for everyone and might have a revelation or two about tea, its origins and taste notes. For all of you that do not dare leaving the house when the winter winds strike, we have some good news, too! Tea Mountain has an online shop, where you can order your favourite type with a simple click! Time for some ORIJINal tea! The lovely team of Orijin approaches the tea theme in a modern and yet very atmospheric way. With their endless knowledge of tea and its wonders, the team of Orijin will make you want to visit their tea house over and over again. Besides perfectly brewed tea and friendly staff, they also host a small exhibition of tea pots within their premises. If you want to know more about growing, harvesting and brewing the perfect cup, Orijin holds all the answers you might need. Dozens of plants and a small fish pond with a stone fountain make you want to sit down and enjoy the perfect pot of tea you are about to get. Though located just off the busy road of the Narodní mall, Orijin is an oasis of calmness and quiet; just what you want when enjoying your favourite cup of white, black or green tea. Serving healthy and yummy snacks to go with the tea – such as Goji berries and Chinese dates – Orijin is the perfect place for your tea time in Prague! The only hint towards Dejvická čajovna is a ‘čaje’ sign on green background pointing towards an entrance. Curiosity is being rewarded with cozy seating, wonderful tea and hookah! Dejvická čajovna is only a 7-minute walk away from Hradčanska and your stop to get onto the orient express. Gorgeous Persian carpets embellish the walls of the cozy tea house and makes staying a few hours an easy task to accomplish. Not only the interior makes this place one of our favourites, but also the tea and hookah menu takes us in its ban. Dejvická čajovna is a wonderful place to spend an afternoon – or evening, since they are open till 10 p.m. – at. And stepping out of the atmospheric space becomes harder with every cup of freshly brewed tea we get! 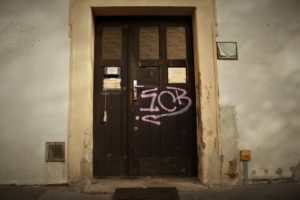 The door to Asia sits in Prague. More precisely so just off Jiřího z Poděbrad. 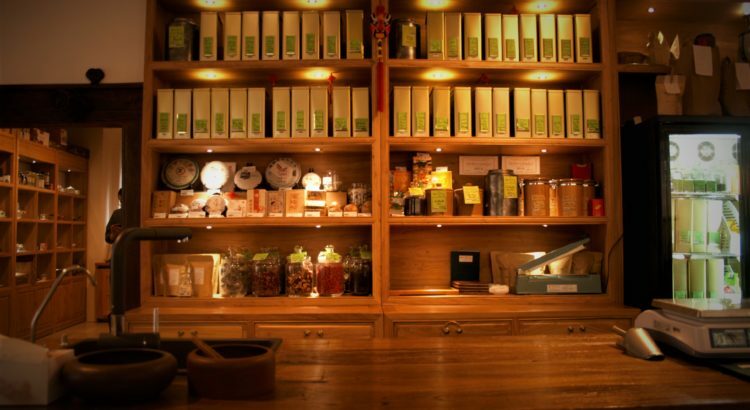 Tea Tao will take you on a journey through the ancient tradition of tea growing and brewing. Just entering the place makes us feel like we are in a lovely little tea room in ancient China. This place is the perfect place to get your tea if you enjoy drinking it in the comfort of your own house. 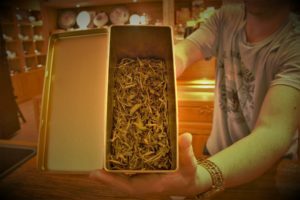 The guys from Tea Tao are real tea lovers and thus choose only the best varieties of tea. Their products are carefully chosen and find their way to Prague from very specific plantations. After harvesting their meadows and groves, Tea Tao stores their tea leaves at low temperatures in order to provide you with a fresh cup – always. Working with companies that engage in and support organic farming, your tea is sustainable and free of nasties. Tea Tao specializes in tea from China, Japan and Sri Lanka. Just recently, they expanded their tea assortment with leaves from India and Nepal. The variety and quality of the tea they sell makes us want to return for some more tea leaves. Ready for your next tea time? Then set out to one of the coziest places with the best brews of Prague. Do you have a favourite Tea House and want to let others know? Did you already check out one of the places above? Tell us all about it in the comments! 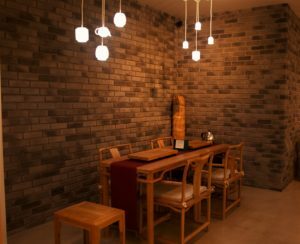 You missed out on Mist, a restaurant/tea house with some of the most incredible organic Chinese teas, many only available there at Mist. Highly recommended!